As some of you may recall, I wrote a post a few months ago about my lazy orchid, and how I had been watching its two stubborn little buds for weeks on end, waiting for them to bloom. But…shortly after that post, a new sprout began inching off from a different part of the plant. It looked as if it had purpose, and I anxiously kept my eye on it. (Again, for weeks. 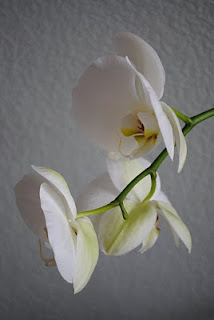 These orchids do take their sweet time.) Lo and behold, the sprout produced three bona fide buds, which bloomed just in time to grace my home with beautiful flowers for Christmas. It was a most unexpected, but very welcome, development. Life is full of twists and turns, for “regular folks” and writers alike. Before they were famous authors, Scott Turow and John Grisham were lawyers. Dan Brown and Stephen King were teachers. Zane Grey was a dentist. William Carlos Williams was a pediatrician. Langston Hughes was a busboy. Jack London was an oyster pirate. Mary Higgins Clark was a copywriter, a model, and a stewardess. A career in writing may not have been an unexpected development for any of them, but perhaps the success they experienced was. In 2010, my own modest unexpected development came in the form of blogging. At the beginning of the year, I never anticipated that I would end up writing for one blog and starting my own. I assumed that everything I had to say had already been said by someone else in the vast blogosphere. Maybe that is indeed the case, but I jumped in, anyway. On this last Writing Bug post of the year for me, I’d like to thank Kerrie for giving me the opportunity to fill a spot on the NCW blog team. And an even bigger “thank you” goes out to all of you who read my posts. I’ve been toiling away in obscurity in my basement for so long that it’s quite a nice change of pace to know that a few people are actually reading what I’ve written. In return, I’ve enjoyed visiting many of your blogs and hope you’ll keep the posts coming in the new year. Very best wishes for a healthy and prosperous 2011! It’s the unexpected twists and turns that can turn out to be the most fun. Love the 2nd orchid photo. It is totally frame-worthy. I also love unexpected developments-they add extra spice to our life. Thank YOU for agreeing to be part of the NCW blogging team. You are a talented writer with a witty writing voice that I look forward to reading each week. Happy New Year! I love the orchid photo, too. I'm so envious, Jenny. I've never managed to get an orchid past the first bloom. Well done! It's great that you're having such fun with blogging. Getting to meet so many nice people around the world makes it all worthwhile. Thank you for your comments! I hope 2011 brings some fun new twists for all. I wish I could take credit for the orchid, Pat. I honestly don't know how I haven't killed it off yet. Beautiful post and beautiful photos. The orchids make a perfect metaphor for writing. Patience, passion and faith are the key ingredients. Thank you for sharing with us!